@beardforthree You guys have the moves! Love it! @megynkelly Never came on because of NASCAR! Will there be a repeat? @STEVExGOLD I love that sweater! @jimmyfallon What a snub! You are the absolute BEST night time show! Colbert??? @perolikewyd What was the name of Raven's disease? I saw someone started a gofundme for her. @NBCNightShift So glad you are back! Great show! @princessglammy Why aren't you watching BB? I follow u for other reasons too! Like food! @MCMEleganteDAL Totally agree! Great place to stay! @RedNinetyFour Yes-but I still want to know what happened "really" in game 6. Fun season but with no expectations for next year. 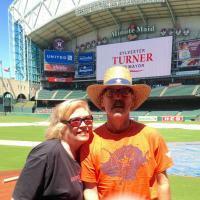 @ChronBrianSmith @HoustonChron I'm still trying to figure out the Rockets game 6! Will watch finals though. @JHarden13 James, you're my MVP! Just want to know what really happened??? @ATT As a 37 year retiree- the ad with Mark W. is awesome ! @HoustonRockets So proud of the Rockets! @jtimberlake How bout those Grizzlies? @Jonathan_Feigen What happened to Capela?